Excellent chemical resistance, impenetrable by most chemicals with the exception of concentrated sulphuric acid. Excellent thermal and water resistance; maintains high heat-resistance strength. Excellent abrasion, shock and fatigue resistance. Excellent radiation resistance and electrical properties. Heat-resistant temperature: 180o Celcius (UL approved temperature). Excellent flame-resistance cleared by UL standard 94V-0. Useful for hot-water pumps, chemical pumps, chemical-resistant applications such as FPD (Flat Panel Display) and semiconductor production equipment/devices, printed circuit board etching devices, metal plating equipment and chemical plants. Use with a nut to compensate for thread moulding pitch errors. 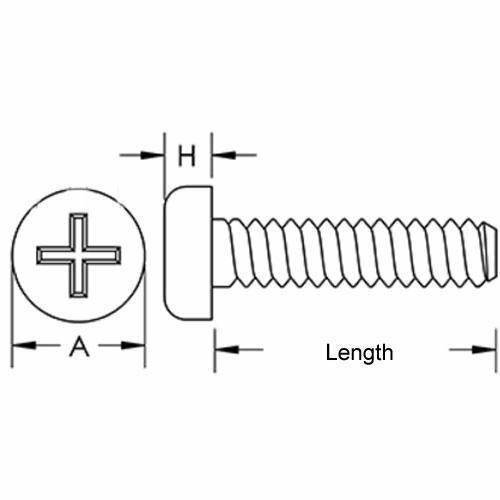 When a nut is not used, it is recommended that the overlap of mating screw threads be shorter than 20mm. For further information on the special properties of plastic screws and cautions concerning their use, please contact sales. M2x0.4 (2mm Standard). 4.0. 3.5. Deleted Item. Available while stocks last. M2x0.4 (2mm Standard). 10.0. 3.5. Deleted Item. Available while stocks last.